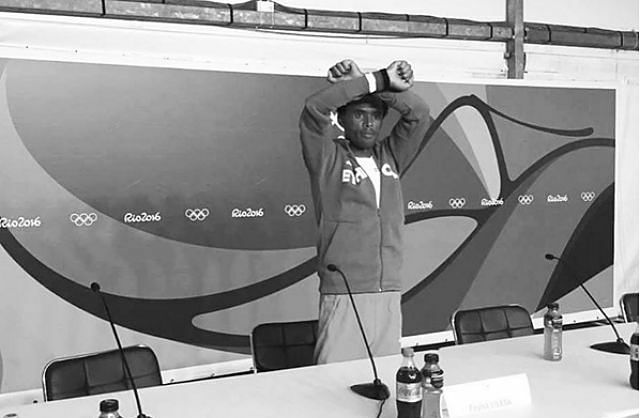 New York (TADIAS) — When 26-year-old marathoner, father of two and social activist Feyisa Lilesa approached the finish line with his hands crossed over his head to claim the silver medal during the 2016 Olympics in Brazil he brought global attention to Ethiopia’s long-brewing political demonstrations. In an instant his daring move made international headlines, creating awareness about the deadly civil unrest that has rocked Ethiopia from Bishoftu to Gonder for the past 13 months. Foreign Policy magazine has dubbed Feyisa as a challenger and one of the leading global thinkers of 2016, not only for “breaking the rules of the games” but likewise for his subsequent statement to the press emphasizing that he “wanted to be a voice for a story that wasn’t getting any coverage.” As Feyisa is now in exile in the United States, a government-imposed state of emergency has been instituted in Ethiopia and political tensions remain high. As we hope for better times in the years to come, we never cease to be inspired by the numerous talented Ethiopians around the world, both young and old, that we continue to profile and highlight in this magazine, who drive us all to imagine that through perseverance, unity, and creative thinking, a brighter, bolder, and more peaceful and prosperous tomorrow is still possible. This year the people we spotlighted on our website included the 2016 class of the Mandela Fellows from Ethiopia as well as the second cohort of Ethiopian Diaspora Fellows from the United States. We close the year with a recent interview with Yohannes Abraham, the first Ethiopian American working in a senior White House role.